Input text: the tree is thirty feet in front of the very huge silver wall. the tree is 30 feet tall. a second very huge silver wall is 60 feet in front of the tree. a large silver star is on the tree. a large silver sphere is five feet under the star. it is four feet in front of the star. another large silver sphere is five feet under the star. it is five feet behind the star. another large silver sphere is ten feet under the star. it is five feet in front of the star. it is one foot to the left of the star. another large silver sphere is ten feet under the star. it is six feet behind the star. it is one foot to the left of the star. another large silver sphere is fifteen feet under the star. it is five feet in front of the star. it is one foot to the right of the star. another large silver sphere is fifteen feet under the star. it is six feet behind the star. it is one foot to the right of the star. another large silver sphere is twenty feet under the star. it is five feet in front of the star. it is one foot to the left of the star. another large silver sphere is twenty feet under the star. it is six feet behind the star. it is one foot to the left of the star. 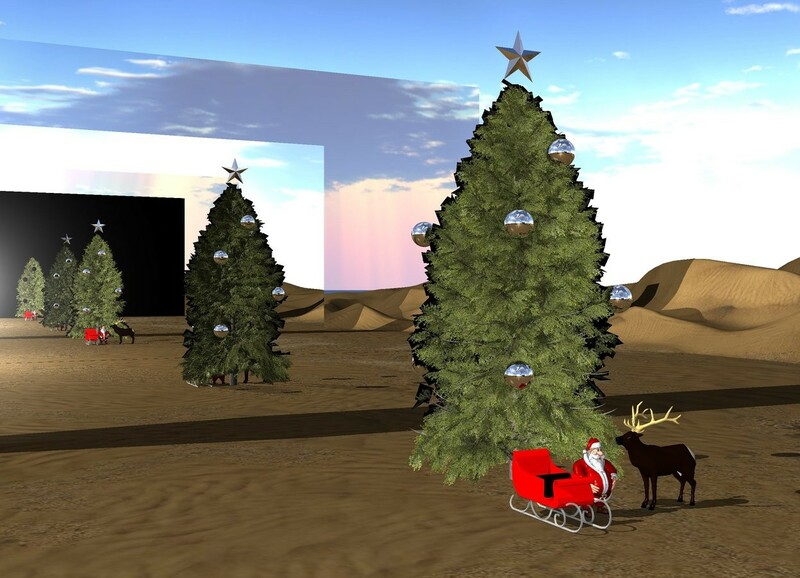 a santa is in front of the tree. a red sleigh is to the left of santa. a reindeer is to the right of santa. it is facing santa. those ornaments are hanging on your every word!